HARLINGEN — The forecast is in, and quail numbers appear to be slightly down from last year. Quail season begins Saturday and the Texas Parks and Wildlife Department rural road surveys in the South Texas Plains indicate 10.6 quail were reported per 20-mile route this summer. 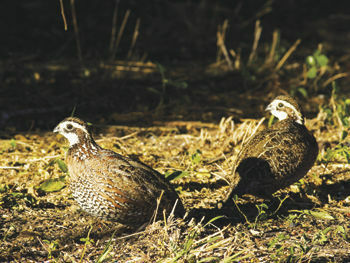 Last year, the average was 14 quail sightings in South Texas. When it comes to quail populations in South Texas, it’s all about the rainfall. Since the state came out of a serious drought in 2013, “we’ve had a run of some pretty good years,” said Leonard Brennan, the C.C. “Charlie” Winn Endowed Chair for Quail Research at the Richard M. Kleberg Jr. Center for Quail Research at TAMU-Kingsville. “There are areas right around Kingsville and southern Kleberg County that kind of had a tough time this summer, but then you get further south in Kenedy County and down to the Valley, and I’ve heard from that part of the world that it’s really good. “We’ve got a lot of area in South Texas that does a pretty good job of producing quail when it rains, and that’s exactly what we’ve been seeing,” Brennan added. Statewide, 2016 was a renaissance year for quail hunting, a reminder of how good it can be when everything comes good, quail-wise. “Specifically, weather and habitat aligned to create a ‘super boom’ year for quail production that led to exceptional hunts the likes of which had not been seen in many years,” TPWD biologists said. This year’s quail production is expected to be adequate but not spectacular, particularly in the Valley’s region of the South Texas Plains. “Portions of South Texas and the Rolling Plains regions were in moderate drought during mid-summer, which may have negatively impacted brood survival,” said Robert Perez, quail program leader with TPWD. TPWD bases its projection on statewide quail surveys started in 1978 to monitor the bird’s population. This index uses randomly-selected, 20-mile roadside surveys to determine annual quail population trends by ecological region. The information helps determine relative quail populations among the regions of Texas. The long-term loss of habitat has been a primary factor in the decline of bobwhite and scaled quail in Texas. Up until last year’s boom year, bobwhite quail populations have been declining about 5.6 percent each year and scaled quail have seen a decline of 2.9 percent annually since 1980, biologists say. And it’s not just quail. TPWD biologists say at least 24 other grassland birds like scissor-tailed flycatchers and meadowlarks are all in serious decline, and that since 1968, these habitat-specific species have lost nearly 40 percent of their populations despite not being hunted. The TPWD and private groups are actively involved in improving grassland habitat by planting native grasses, and much of the funding for these efforts come from hunters. “Things have dropped off around Texas,” said TAMU-Kingsville’s Brennan. “We are below 100,000 quail hunters anymore these days. “But the Rolling Plains and South Texas are two of the last great places for quail anywhere,” he added.